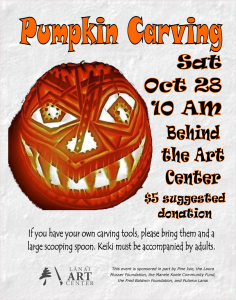 Pumpkin Carving returns to the Art Center! Thanks to the generosity of Pine Isle and Richard’s Market, we will have plenty of those classic orange gourds to challenge your creativity. We will have a big table set up outside behind the Art Center. Bring your carving tools if you have, and also a large scooping spoon. This event is open to all but, please, keiki must be accompanied by an adult. The fun begins Saturday, Oct 28 at 10am and will go until we run out of pumpkins. 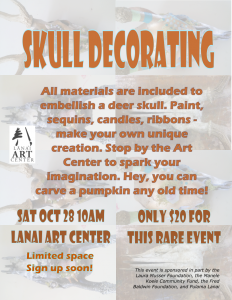 The Lanai Art Center is a non-profit community center providing this event for no cost to you, although a $5 donation is suggested. Spread the word! See you there. 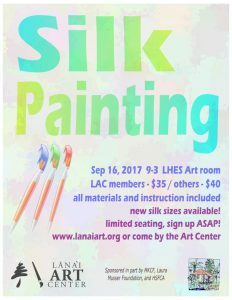 Here’s another opportunity to make your own silk art. We have new sizes available so you can create a scarf, pareo, table cloth, wall hanging, or whatever you can image. Michelle Fujie will be guiding you along the way so this workshop is appropriate for beginners as well as accomplished silk painters. There is limited space and we need a minimum of 6 to run this workshop, so please sign up ASAP. Come by the Art Center to sign up or you can easily register by clicking here. Sign up soon and spread the word! Our last scheduled Paint Party was rained out but we won’t be deterred. Come enjoy a casual evening of instructor led painting. 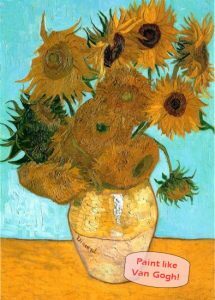 Paint like Van Gogh, but keep your ear! Beginners will be proud of their creations to show off to friends and family; experienced painters will improve their skills while tackling a new project. All materials are included, as is one pupu of your choice. More food items are available from Pele’s fine menu as well as beer, wine, and yummy cocktails. We do need a minimum of 6 artists (12 max) so please sign up soon! You can drop by the Art Center to sign up, or for more information and registration, please go here. See ya there! If you have been to the Art Center gallery, surely you have seen the amazing weavings displayed. If not, you must come in and check them out. 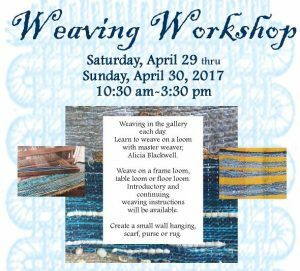 And now you can learn to weave a small wall hanging, scarf, purse, rug or other fabric art from master weaver, Alicia Blackwell. Weave on a frame loom, table loom, or a floor loom. Introductory and continuing weaving instructions will be available. This workshop is being held Sat, April 20 thru Sunday, April 30, 10:30 am – 3:30 pm. All materials are included. Limited to 6 participants ages high school and up. Sign up early! Come in to the Center to sign or sign up online here. $45/LAC members, $50/non-member. 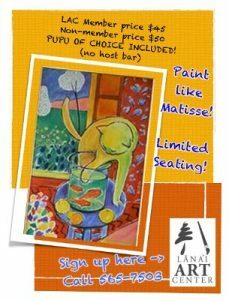 Paint & Party at Pele’s – Rescheduled for May 6! The party continues! On May 6 we will conduct another Paint Party at Pele’s. Eat, drink & paint as instructors guide participants to create their own artworks. This month,we go under the sea. No previous painting experience is required, let your inner artist escape! All supplies and one appetizer is included. You can order drinks and more food off the menu (not included). Seating is limited to 12 participants so don’t delay; this has proven to be a popular event. You can sign up at the Art Center, or for more information and online registration please go here. We’re doing it again! 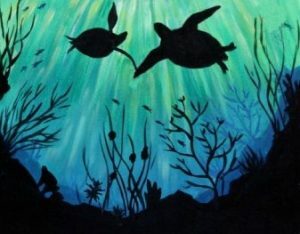 Join us Saturday, March 25 to Paint & Party at Pele’s. This month you can paint like Matisse. We are limited to 12 seats so come into the Art Center to sign up soon. For more information and to register on line, please go here. Here’s an event you won’t want to miss. On Feb 25th, we will conduct a Paint Party at Pele’s. Eat, drink & paint as instructors guide participants to create their own artworks in the style of a master. 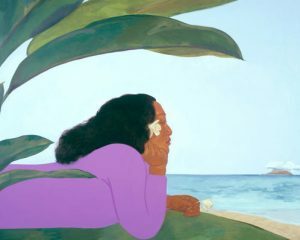 This month it will be Pegge Hopper. All supplies and one appetizer is included. You can order drinks and more food off the menu (not included). Seating is limited to 12 participants so don’t delay! You can sign up at the Art Center, or for more information and online registration please click here. The Lanai Art Center presents the first “Around the Square” event of 2017. 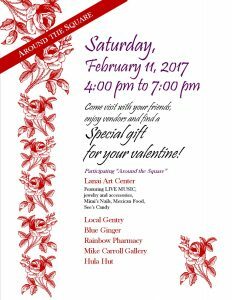 On Feb 2, it will be Valentine’s Day ‘Around the Square’ from 4-7 pm with Live music, Mexican food, mini-mani’s by Mimi’s Nails, See’s candy sales, and valentine’s gifts featuring handmade jewelry and beautiful accessories. For the month of February we will have make your own bracelets for a minimal fee in the gallery. Come out and get ready for your sweetie! We hope you had a wonderful Holiday Season and have a great 2017! In 2016, the Art Center saw several changes. Sarah Jones took on greater responsibilities within her pastor duties and passed the reins as LAC Director to Bill Moore. Bill has been busy updating procedures and technologies to improve accurate payments to artists. LAC is also implementing a new membership management system to better track and service our constituents. We are still working out the bugs, so our apologies if you receive multiple mailings. We are also in the process of updating our website to make it easier to find out what’s happening at the Art Center. Currently on our website you can become a member or renew your membership, make a donation (hint), and register for events. By creating a user account, you can ensure we have your current contact information, you can receive event discounts, and you save us money. Thanks for your cooperation! As 2016 comes to a close, LAC is thankful for the many years of service Jeanne Marie has contributed as the gallery’s coordinator. We are pleased to announce that Alicia Blackwell is now the gallery coordinator and hopes to have the gallery open 6 days a week with a volunteer staff. To accomplish this we will need more volunteers. You do not need to be an artist to volunteer at the art center, only a community member. Please come see Alicia at the Lanai Art Center on Mondays 10-4 or call at 565-7503. We are looking for more local talent! Here at Lanai Art Center, while our gallery will always be a co-op for all local Lanai artists, we would like to return to our roots and make the Art Center a gathering place for the creation of the arts through classes, workshops, studio access and local artists’ showcases. LAC is expanding to include new and old classes and workshops in the new year. We have begun with a Ceramics Introductory class that is ongoing on Wednesday evenings. We are pleased to see the ceramics studio getting much more use these days. We are in the process of updating the wood shop and hope to see the sawdust flying! If you would like to spread your talents to our community, please come talk to us to discuss your ideas for a workshop or class. Share with us your visions and ideas. We encourage new works to be displayed at Lanai Art Center as this is truly a community art center. A percentage of the profits pay for Keiki art classes year round and benefit the community in many ways. We would love to see beading, painting, silk screening, poetry readings, photography and others on a regular calendar of events. Our proceeds support our local kids! We will always provide art opportunities for the Keiki. This past semester, LAC partnered with the LHES library for creative activities that serviced over 140 participants in a variety of crafts including metal work, weaving, and painting. Mommy & Me sessions are held Mondays for parents with preschoolers. This coming school semester, Ms. Sagawa will be providing crafty art projects 3 days per week in grade 1 – 5 classrooms. We welcome everyone to come into the gallery and enjoy the beautiful locally hand made art and participate in classes and workshops. We would love to have you join the Lanai Art Center ohana! Remember, it’s easy to join online and you can always drop by the Art Center for a membership application. Included in your membership is free open access to both studios. Membership is only $30 for individuals, and $60 for a household of four. Lanai Art Center is a 501(c)3 nonprofit and donations are always welcome and can easily be made on our website. Have fun learning watercolor techniques from a renowned teacher! LAC presents the third annual Kathleen Alexander Watercolor Workshop. Kathleen is a gifted water-colorist and teacher who lives in Haiku, Maui. This is a two day Watercolor workshop (beginners welcome) where Kathleen will provide detailed instruction on how to paint a tropical flower from beginning to end.It will be held at the LHES High School Art Classroom on Saturday and Sunday, January 21-22, 2017 from 9 AM-4 PM each day. Coffee and snacks will be provided. For more information and to register call, come to the gallery, or better yet, register online!